Flying is fun, but once in a while taking the train just makes more sense. Saturday, May 8th, 2010 is National Train Day and there will celebrations around the country in major train stations, small depots, and transportation museums around the country. You can read my column on the festivities – Marking Americans’ love affair with the rails , but here are a few highlights and a few bonus photos. At Philadelphia’s 30th Street Station, there will an exhibit titled Baseball Junction: The History of Baseball and the American Railroad with memorabilia, photos and videos. Several former major league players will be on hand to sign autographs as well. At Chicago’s Union Station, they’ll be talking about the role train travel played in the history of blues music in America. Posters and other memorabilia from the Chicago Blues Museum will be on display and there will be a performance of train-themed blues songs by Big Bill and Larry “Mud” Morganfield, who are the sons of legendary blues musician Muddy Waters. Mississippi Delta blues musician Bobby Rush will join them. And Union Station in Los Angeles will have an exhibit about the Railroad Braceros. During World War II, there was a shortage of manual laborers in the United States and thousands of Mexican citizens were invited to come to the United States as part of the bracero, or guest worker, program. The more than 130,000 Mexican men who joined the ranks of the Railroad Braceros helped build and maintain the country’s passenger rail system. 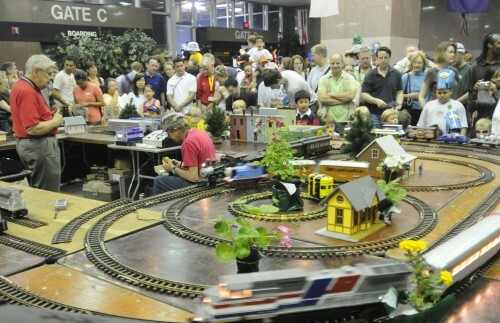 There are more than 130 other events marking National Train Day around the country. To find out what’s happening in your town, check NationalTrainDay.com.